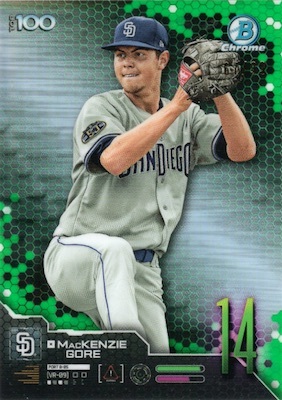 Adding another option, the Bowman Chrome Prospects line features a whopping 18 Refractor parallels. Among the choices are Blue Shimmer and the all-new Speckle versions. Spotting the ROY standouts, Rookie of the Year Favorites focuses on the names that might earn hardware after the season. These have new Atomic Refractors. Collectors can also find Bowman Scouts' Top 100 and Talent Pipeline inserts, each with six parallels. 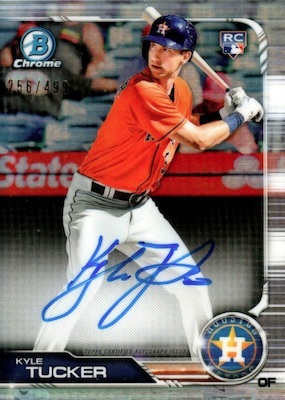 However, the key chase in the 2019 Bowman Baseball checklist comes from the on-card Chrome Prospect Autograph lineup. Among the 14 Refractor parallels are Gold cards and the debut Speckle editions. RC players earn similar treatment in the hard-signed Chrome Rookie Autograph set. Collectors must track down eight parallels, not including the plates, to complete the rainbow. 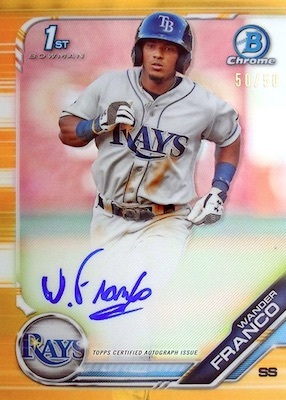 Wander Franco 2019 Bowman Chrome 1st Auto!! 2019 BOWMAN CHROME PROSPECT AUTO PURPLE REFRACTOR MATEO GIL #'d 44 250! 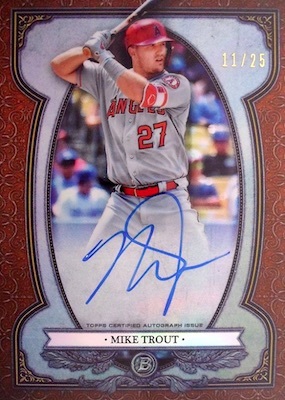 Buy Bowman boxes direct from Topps. PARALLEL CARDS: Camo (Value Pack SKUs), Sky Blue #/499, Purple #/250, Blue #/150, Green #/99 (Retail), Gold #/50, Orange #/25 (Hobby), Red #/5, Platinum 1/1, Printing Plates 1/1. REFRACTOR PARALLELS: Atomic (Hobby), Base Refractor #/499, Speckle #/299, Purple #/250, Blue #/150, Blue Shimmer #/150, Aqua #/125 (Hobby/Jumbo), Aqua Shimmer #/125 (Hobby/Jumbo), Green #/99 (Retail), Green Shimmer #/99 (Retail), Yellow #/75, Gold #/50, Gold Shimmer #/50, Orange #/25 (Hobby), Orange Shimmer #/25 (Hobby), Red #/5, Red Shimmer #/5, SuperFractor 1/1 (Hobby/Jumbo), Printing Plates 1/1. 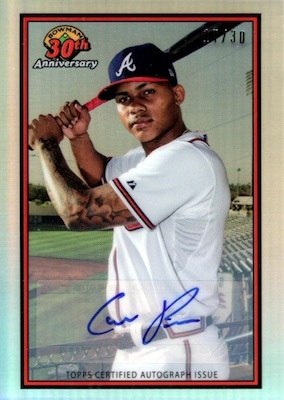 Buy 2019 Bowman MLB autographs on eBay. REFRACTOR PARALLELS: Base Refractor #/499 (Hobby/Jumbo), Speckle #/299 (Hobby/Jumbo), Purple #/250 (Hobby/Jumbo), Blue #/150 (Hobby/Jumbo), Atomic #/100 (Hobby/Jumbo), Green #/99 (Retail), Green Shimmer #/99 (Retail), Gold #/50 (Hobby/Jumbo), Gold Shimmer #/50 (Hobby/Jumbo), Orange #/25 (Hobby), Orange Shimmer #/25 (Hobby), Red #/5 (Hobby/Jumbo), Red Shimmer #/5 (Hobby/Jumbo), SuperFractor 1/1 (Hobby/Jumbo), Printing Plates 1/1 (Hobby/Jumbo). REFRACTOR PARALLELS: Base Refractor #/499 (Hobby/Jumbo), Blue #/150 (Hobby/Jumbo), Atomic #/100 (Hobby/Jumbo), Green #/99 (Retail), Gold #/50 (Hobby/Jumbo), Orange #/25 (Hobby), Red #/5 (Hobby/Jumbo), SuperFractor 1/1 (Hobby/Jumbo), Printing Plates 1/1 (Hobby/Jumbo). 7 cards. Serial numebred #/25. 11 cards. Serial numbered #/150. 15 cards. Serial numbered #/99 or less. REFRACTOR PARALLELS: Orange #/25 (Hobby), Red #/5, SuperFractor 1/1. REFRACTOR PARALLELS: Atomic #/150, Gold #/50, Orange #/25 (Hobby), Red #/5, SuperFractor 1/1. 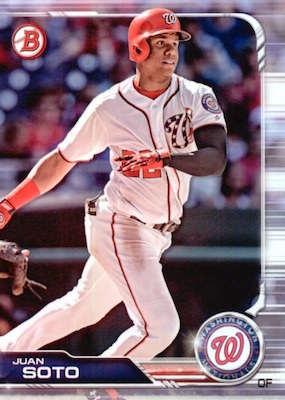 View the 2019 Bowman Baseball checklist Excel spreadsheet. Very nice looking base cards & several inserts available to pull as well. All of them look really beautiful to me. Nice to see a new insert in the Speckle versions. As always, looks like Bowman has passed the test again as they do each year in the baseball card world. We won’t know about 2019 until Topps/Panini reveals the info or until there is a checklist. He has 2014/2015 Under Armour cards from Bowman/Topps that were issued at the events. 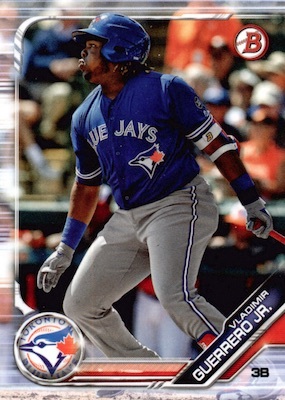 Does anyone know if Topps is doing a Bowman’s Best set this year? I can’t find any info regarding a 2019 release. 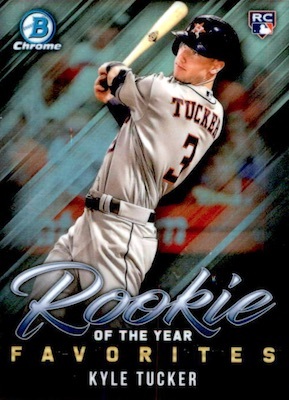 It normally releases in December so it’s way too early for the 2019 Bowman’s Best info. They are just now announcing sets for June and July. Finally a Giants player worth collecting (Bart). Curious to see the international players in this product. Looks like Wander will be there… Diego? Luciano? Looks Like They went up on their pack prices. Only 6 packs in a Blaster box.Down 2 packs from last year. Packs are now 12 cards instead of 10. So a $19.99 Blaster makes the packs $3.50 with no bonus. Value packs are $9.99 with only 2 packs 12 cards in a pack and 5 camo cards. Last year it was 3 packs 10 cards in a pack and 3 camo for same price. Has anyone else noticed this? Only about 30 guys on prospect list that are newcomers. Sick of seeing guys like AJ Puk, Leody Tavares, and Brendan Rodgers in the set for the 4th year in a row. 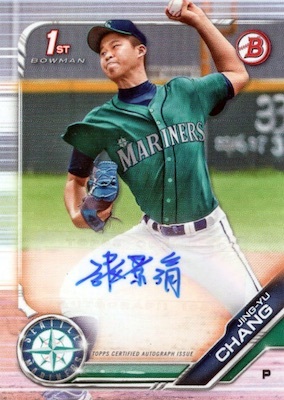 Always a fan of Bowman..
Trey, do you know if there are any variations in this set, like in previous years? Not that I have seen. It’s normally Bowman Chrome and Bowman Draft with variations, not Bowman. Like them . Curious , with all the different Prospect Dual Auto cards, All the Dual Autos have 2 Prospects from the Same Team EXCEPT The Tigers / KC card . Gonna make a Lot of KC & Tigers Breakers Nervous. Especially Tigers . When pulled they have to Ramdom Tigers MIZE & a Player from KC . Someone loses. Bigtime if Kc wins random . THANKS TREY for your column here !!! Winder why some of the Autograph inserts don’t have the player’s actual name stamped on the card somewhere? I mean some of these guys hand-writing is nearly impossible to read. Unless you are really familiar with the player & his looks/appearance then certain autos are going to be having people guessing until they turn the card over on the back to get the name. The player’s name should be stamped on 100% of the autos period. I don’t have a preference as to where on the card but somewhere. Typical place would be at the very bottom of the card horizontally across. I totally don’t get leaving the name stamp off the card at all. MITCHELL——. You’re absolutely correct on the number of cards in a retail blaster and the hanger packs. 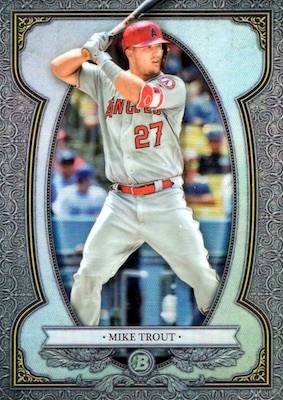 If this is going to be Topps trend now, I’ll just purchase singles I want off eBay or COMC. Too bad, I always looked forward to Bowman each year. Thanks Trey…Also, is the Bryce Harper an SP, or SSP? No word on rarity. I’ve already seen several on eBay and that includes a Purple parallel with a print run of 250. Opened a box of this today and did not get a autograph. Not the first time I have been shorted a hit by Topps. Will Topps do something about this or will they just say oh well, bad luck. new to bowman. bought a blaster. on card autograph. is this real or a reprint? Most Bowman autographs are hard-signed and I don’t think there are any inserts with facsimile autographs. The back should make note of the signature. I really like this set because of all the bright colors on the Prospect and rookie cards. 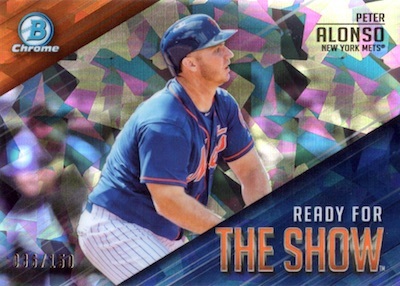 The only thing that confuses me about the artwork on the front of the card is how do you determine centering? Since there are only three borders on the card and one side wide open with the bottom border being totally indeterminate of any type of thick or thin, how are you supposed to determine centering on the front of these cards? The rear of card is very simple as far as determining centering. You must need a Captain Crunch secret decoder ring to decipher the centering on the front of these cards. 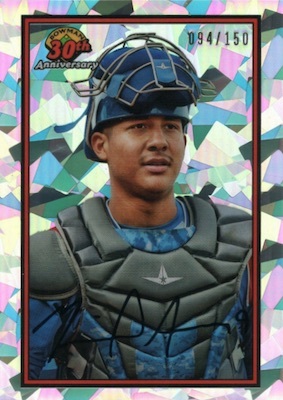 Bowman Chrome does one good thing with all the nice colors and then totally screws the cards up with only two determinant borders on the front of the card. Way to go with Topps. I was wondering when they will have a updated excel spreadsheet on the 1989 buyback cards. I pulled a Andre Dawson redemption and wanted to know how many there are??? I haven’t seen anymore on ebay. There won’t likely be any update to the checklist as Topps doesn’t normally do that. The actual card you get might be numbered so you could find out the exact rarity when the card arrives. Ah, yep, I forgot about those. I busted 2 Hobby boxes at the LCS yesterday. I pulled an Andrew Bechtold auto in the first box and a Bowman Sterling Continuity Orange Refractor Kyle Tucker RC auto #’d/25 in the second box. 4 or 5 numbered parallels/refractors and 1 Atomic Refractor in each box. Giving 5 stars based on my experience. 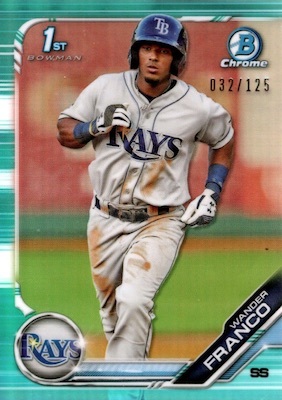 The Chrome versions have the Bowman Chrome logo on front in addition to the different stock. Paper Bowman has the regular Bowman logo on front.